It was Great Wednesday when I was received into the monastery and I was appointed to assist in the guest quarters. At that time, the holy sketes and hermitages were full to overflowing with monks, and the holy monasteries, which still had their dependencies then, provided lavish alms. Every Saturday, ascetics and hermits would come, stay for the vigil and receive the customary alms. I had a natural sympathy and was piously disposed towards them, but also shy of asking questions, out of respect. I would try, sometimes by eavesdropping, sometimes by sitting with them, to listen in to their talks and discussions so that I could gauge their spiritual condition. It was night and we were waiting for the simantra to strike for the vigil. The customary coffee and sweets for the brethren and guests was over and I was sitting relaxing in the “Kafetzaria”  before the vigil for the Fifth Sunday in Lent began. When I heard this I rebuked myself and was cured of the passion of complaining, because we in the monastery ate this food only once or twice a week, and, in any case, the refectory also provided figs or olives, whereas, they, in the arid desert probably had neither of these. The black bryony we cooked were the tips of the climbing plants which grows near water in the underwood, has a bitter taste and is, according to botanists, cathartic and a blood cleanser. It grows in all the damp places on the Holy Mountain and its tender shoots burst through the earth from the beginning to the end of March and are reckoned to be a blessing from God for this period of the fast. To anyone eating them for the first time, especially without olive oil, as is the case on the Holy Mountain during the Fast, they really do seem harmful and poisonous, but the fathers become used to them in time and find them edible and beneficial. 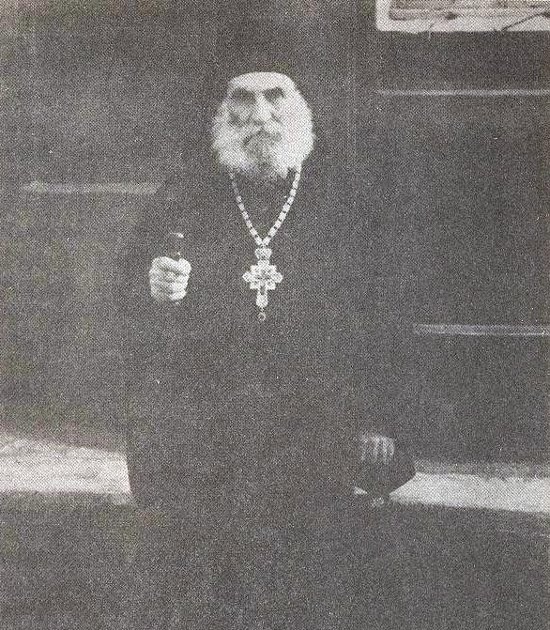 The Elder of the late Elder Porphyrios. The place is the guest quarters where coffee and tisanes are brewed. From the Lausaikon of the Holy Mountain.